"If music be the food of love…" | First Option Software Ltd. 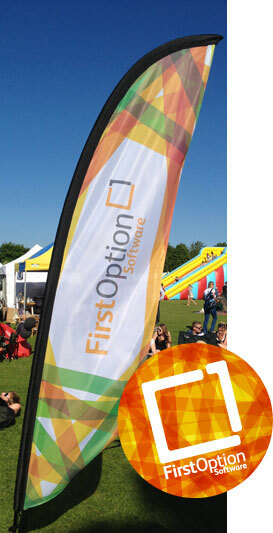 So sayeth one of the many colourful signs around the ground at Arlebury Park in Alresford on Saturday, the perfect setting for the fourth Alresford Music Festival and the fourth such event to have First Option Software as its principal sponsor. And what a day it was – following a rather indifferent and cloudy Friday set-up, Saturday boasted wall to wall sunshine from start to finish, making it a perfect, laid-back day for all ages and musical tastes. Over twenty bands played throughout ten hours on four stages, headlining with the nine piece The Earthlights Boogie Band on the First Option Stage as the sun finally disappeared on this super mid summer day. There was Fun Stuff too – dance classes with Popdance Kids, music workshops with free Rock Out! taster lessons for budding guitarists, drummers and singers, circus workshops and Zorbing. There was plenty to eat and drink, loads of room to move around and watch and listen in comfort – which was surprising considering there were around 2,000 people there. And we had fun too, giving away prizes left right and centre! By taking a free NFC sticker (Near Field Communication, with a unique serial number embedded on a printed circuit in it) to the First Option tent, we were able to scan it to see if those lucky people had won an Amazon voucher – which we had 25 of to give away – and enter them for the main draw to win a Google Nexus7 tablet worth £180. The draw was made on stage and our lucky winner of the tablet, Claire Leebrook, was there to pick up her prize. It gave us the perfect opportunity to show off our 2013 version of our festivals app, especially skinned for AMF and this year with the added bonus of an Android version. No more guessing what was on and when – it was just a case of viewing the upcoming acts on your phone! And in a few weeks’ time, we’ll be doing it all over again at the Winchester Hat Fair when we will be supporting the 39th year of this international street arts festival on Sunday 7th July at Oram’s Arbour in Winchester. We’ll have more NFC stickers, more Amazon vouchers and another tablet to win, so watch out for us!